If you've been feeling tired and in need of some energy, then this is the perfect session for you. Sit back and relax as you harness the power of your mind to boost your energy and let go of any stress and tension you may be holding onto. Experience self hypnosis from the comfort of your own home. Feeling tired, exhausted and in need of a recharge? • Experience the power of self hypnosis in this short audio session - in just 7 minutes you'll be feeling renewed and refreshed! • Start feeling like you again by releasing any stress or tension you may be holding onto. • Recharge your energy levels as you harness the power of your mind to create powerful changes internally. 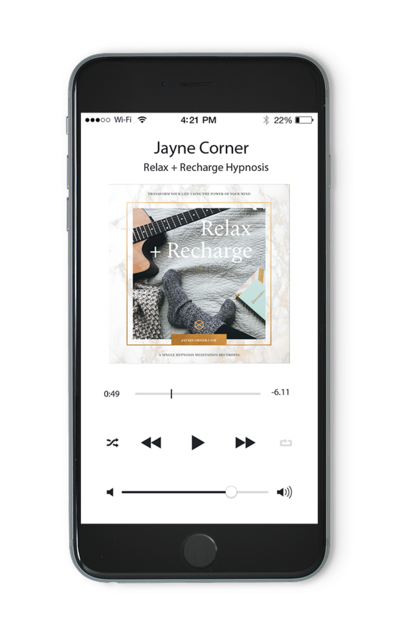 A welcome email is on its way from me to your inbox and it contains a link to your free Self Hypnosis Audio Session, Relax + Recharge.